Janie stopped by with some lovely quilt projects that she is working on. 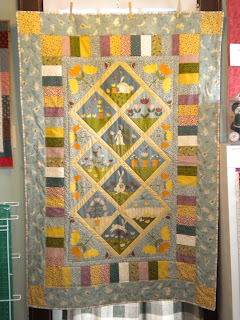 June shared this beautiful wall hanging. It is so peaceful looking. Just wonderful! Love it! Club Day was last week and some of our members have been very busy. Mary Alice made these lovely pillows. 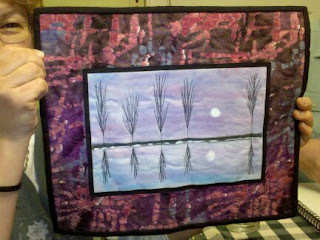 Zlaty made this beautiful wall hanging. Pat Christ designed this beautiful quilt. 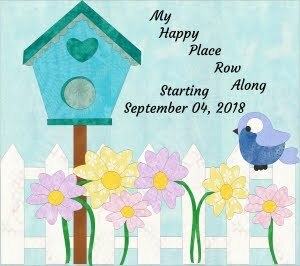 Angie made the first block for her sampler. Beautiful colors. Wonderful job everyone! They are absolutely beautiful! 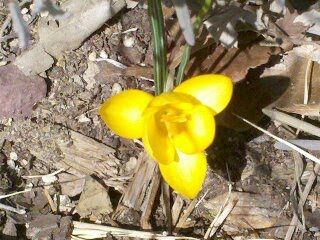 I know that Spring is definitely close when I see my crocus start to bloom. I just love the colors of spring. The beautiful colors of all the flowers and the blossoms in the trees, the greens of the grass, bushes and the trees, and the beautiful blue sky. Try a quilt in Spring colors and brighten up your indoors! 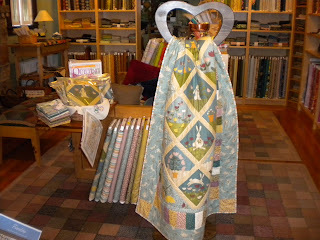 We just got in from Andover Fabrics, "Bunny Hop" by Kim Schaefer. This line features a cute bunny panel and springy coordinates. I just love it! Zlaty made a sample for me and it is beautiful. It makes me even more anxious for Spring to arrive! We have fat quarter packs, kits and fabric by the yard. 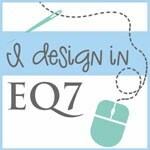 The pattern for the quilt is a free download from www.andoverfabrics.com.